I love mornings. Back in college days I was more of a night owl up in the wee hours of the morning watching TV but over the years I have learned to love the mornings. As strange as this may sound there are nights when I am I just itching to go to bed so that I can wake up again! I love the peace of the morning, the cool crisp air, the hush that has fallen over our house like a snuggly blanket–and I definitely love a warm coffee mug nestled in my hands. But my mornings are not in vain! They are an important part of my day, the time I set my mind on what matters, I plan, I rest, and I am refreshed. The days that I sleep in and miss the stillness of a sleeping household, my days are kind of like a car running out of gas. I feel like I am lurching around, all start and stop and no smoothness. There is no question about it, mornings are crucial around here. 1. I spend time with God. I NEED my time with God each day. My devotional times are not dry, stagnant or boring. They are living, exciting, and crazy! I pour out my heart, my struggles and my worries and God speaks and ministers back to me. This is the time where I plug the coordinates into my navigation system (sorry, car analogy). “THIS” is the day I want to have God and then God shows me a map, He shows me what He wants me to do, He helps me curb my expectations and keep my eyes focused on Him so that when we aren’t going the right direction through the day, I can hear His voice guiding and directing my steps. 2. I use that time to reset. If I do not have that little taste of rest, of peace and quiet… then the chaos just keeps getting more and more chaotic, and I usually miss the point I should have stood up and said “pause!”. Drinking my coffee in the stillness of my own rambled thoughts reminds me what true rest looks like. 3. It allows me to focus my mind. I am a driven person, but I lack focus. I need a few minutes to breathe deep, to gather my jumble of a brain and organize my thoughts. We have all heard the cliche quote “you always have a choice,” and yet I think we miss a crucial point. While we are responsible for our actions and attitudes and behaviour, there are certain things that we do that remove our ability to make good decisions. I can be exhausted but if I have had a bit of time to myself to breathe, drink coffee, do my devotions: I can have an amazing day with my kids. If however I sleep in and wake up to CHAOS… and I am struggling to “fit everything in” when the day is already speeding away at a milling miles an hour. I LOVE planning. I am a list maker (not necessarily a list do-er, but that is for another post). I like to plan my day and make some goals. Even if I never check off my list, writing out my thoughts in an organized way is incredible helpful to me. I’m still in college so I’m more of a night owl like you used to be, but I do enjoy waking up refreshed in the morning because it’s my time to plan the day and focus on what I need to do! At night, I’m just exhausted and want to relax. I am also a mom so I feel like planning (and coffee) is very important in getting the day started. 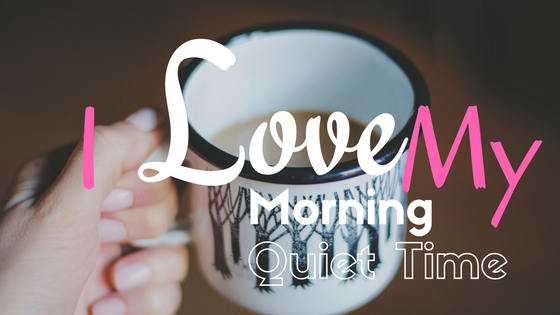 I treasure my quiet time in the morning. I set my alarm purposefully to be able to get up early before anyone else. I need that time for all the reasons you list plus it’s just really good self care. I have always rather been a night owl and I adore late nights up with a quiet house, the day is done and nothing left to do but enjoy myself and peace after a long day. However I think perhaps it might not actually be the best thing for my health, the circadian rhythm science tells us so much about so I am looking at a change for so many reasons! I would be very nice to be inspired in the morning when you can hit the ground running rather than the middle of the night when by the time you wake your inspiration has faded with your dreams! Thank you for adding some reasons to my own list as to why change is needed! I really do love the morning resets. We do NOT have morning quiet time early. Even when I try to get up early, everyone follows. When they all go to school and work, though, that’s my time. I cherish it. I have gotten to the point where I need it!